Dina (Marla Adams) burned down The Underground on ‘The Young and the Restless’. Her Alzheimer’s condition spurned that action. So is it unreasonable to write Dina into the J.T. (Thad Luckinbill) storyline climax? Adams’ performance has been, without question, a complete win since she returned to the cast in 2017. She hadn’t appeared as Dina since 2008, albeit only briefly at that time. It was gutsy for Y&R to revive a character who hadn’t been a regular player since the mid-1980’s. While occasionally referenced, Dina hasn’t been a meaningful part of the Abbott family’s world in decades. Immense kudos to the decision-makers for allowing this superb actor to fully embrace an important topic in such a breathtaking, often time heart-wrenching manner. Hopefully Adams is not just nominated, but honored at this year’s Daytime Emmy Awards as Best Supporting Actress in a Drama Series. It was Halloween of 2017 when Dina accidentally set Nick’s (Joshua Morrow) nightclub on fire, which nearly killed Reed (Tristan Lake Leabu), Mattie (Lexie Stevenson), and Charlie (Noah Alexander Gerry). Dina has regressed significantly within the last year. She has moments of clarity, but isn’t nearly as cognizant of reality as 2019 begins. Though the fight was bitter, the Abbott’s assured Dina’s safety and guarded presence within the past few months. She wasn’t taken out of the house by a true villain during that time, right? How would Dina have burned down the stables at the Ranch? Based on the location of the Newman estate, in comparison to the Abbott mansion, she couldn’t have walked there. But a car could have been called, or she could have been purposely driven there? Viewers know that security at the Ranch is notoriously spotty, so access to the stables wouldn’t have been impossible. 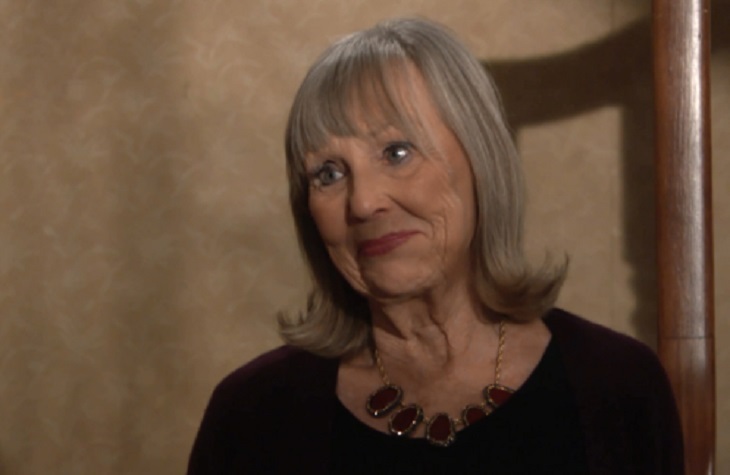 Young And The Restless Spoilers – Dina Being Taken Advantage Of? It would not be believable to put forth that Dina moved J.T.’s body. But could she have been manipulated into placing his bloodied shirt in ‘Niktor’s’ bed for Nikki (Melody Thomas Scott) to find and to have placed Victor’s (Eric Braeden) gun in the stables? Then, could she have burned them down, as directed by whoever the true villain is, in order to torment Nikki and the coverup crew, frame Victor, and establish a unwitting patsy? Viewers will be able to answer those questions and others when the climax to Y&R’s epic storyline is realized.